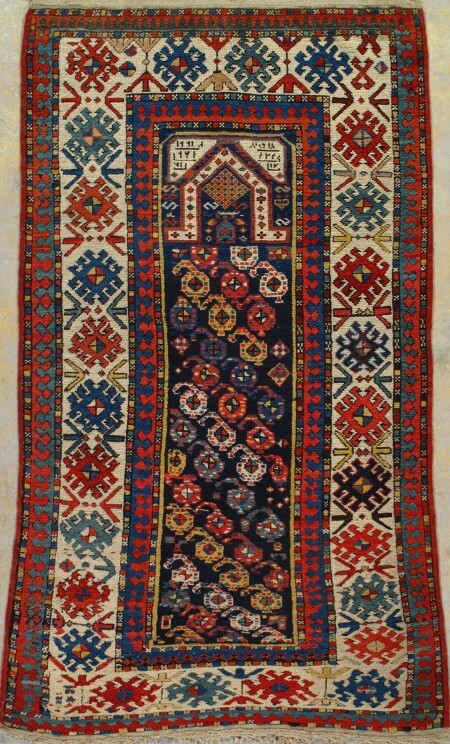 This extremely attractive south Caucasian prayer format rug is in excellent condition, but its exact date and place of origin are a bit of a puzzle. The narrow deep indigo blue field displays diagonal rows of colourful botehs beneath a sharply pointed angular floating ivory mihrab arch. Both spandrels contain dates and illegible inscriptions. 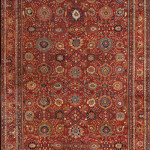 The putative date of 1221 = 1805 is clearly much too early, but the later date of 1271 = 1854 is more likely, although the extraordinary condition would incline one, were the rug undated, to place it around 1880. The discrepancy of the two dates may be resolved by considering it as a birthday gift: the earlier date may be the recipient’s actual year of birth, and the later date may be the year of creation and presentation. The ivory main border is decorated with the classic Caucasian hooked lozenges in a wide variety of colours, including a deeply corroded aubergine and an undyed natural camel hair. Spots of this camel appear elsewhere as details in the minor borders. 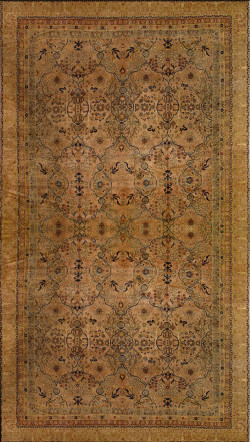 Camel hair is often found in antique Caucasian rugs from the southeast including Moghan, Talish and Saliani long rugs. 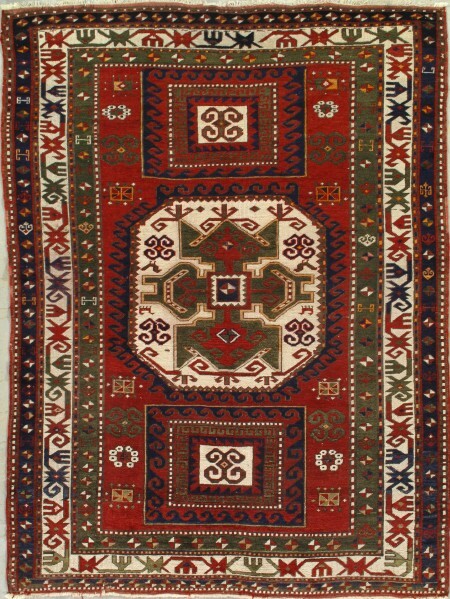 The double ivory wool wefts direct us away from the Gendje rugs of the south central Caucasus. A Kazak or Karabagh origin, despite the medium high pile may be ruled out on other technical grounds. 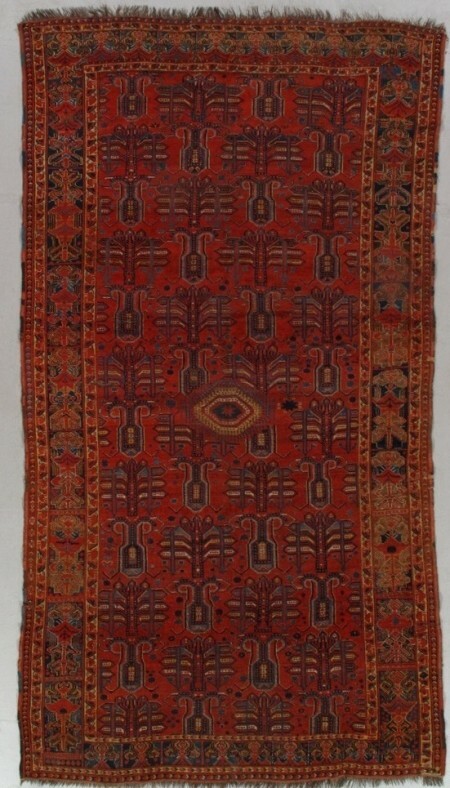 We may provisionally assign this weaving to the southeast Caucasus, but not from a previously well known centre. The colour palette is very wide with at least ten distinct natural dyes. 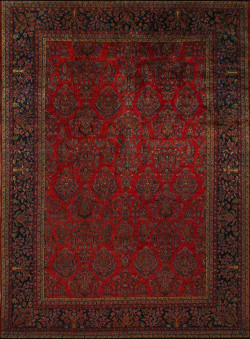 The aubergine is derived from certain non-Alizarine fractions of the madder root and can only be attempted by a highly proficient master dyer. The wide tonal selection is also a southeast Caucasian feature. 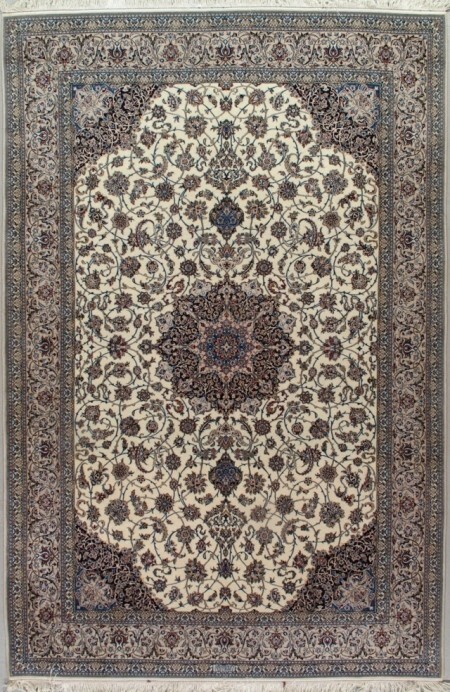 In general, this is is highly professional, richly conceived rug from a true rustic village artist.